There are many different industries that rely on hydraulic hose services for their everyday operations. Quality custom hydraulic hoses are a key component in any type of hydraulic vehicle or equipment system. It is important to choose parts and services that will provide you with the best possible results to ensure that your hydraulic equipment is operating as effectively, efficiently, and safely as possible. The custom hydraulic hoses available through LaCava Brothers Auto Supply help to provide the ultimate fluid conveyance system. Whatever you need, wherever you need it; our team can provide you with top quality hydraulic hose services seven days a week in the Greater Fall River area. At LaCava Brothers Auto Supply, we offer a wide variety of pressure ranges and abrasion resistance to better meet the needs of our customers. All of our custom hydraulic hose services are done with long-lasting, high-performance applications in mind. We use only the most trusted brand in the hydraulic hose business to provide our customers with the best possible results. Gates has been the leader in hydraulic hoses since 1911. From hoses to couplings, Gates products far exceed expectations and deliver quality hydraulic hose services for just about every industrial application. Recognized to meet over 20 international standards and certifications, Gates offers custom hose assemblies and in-depth training workshops for professionals designed to improve onsite safety while increasing productivity and reducing downtime. The MegaCrimp couplings that are used in our custom hydraulic hose services provide more than 500 percent better corrosion resistance than Gates’ competitors. Whenever you work with hydraulic equipment, quality, and safety matters. That’s why at LaCava Brothers Auto Supply we will never work with anything less than top quality, high standard Gates hydraulic hoses, and couplings. Gates provides custom solutions for low-pressure on up to ultra-high pressure hydraulic hose assemblies. Whether you require hoses for application-specific systems or need something that will provide compatibility and versatility for various fluid needs, Gates hydraulic hoses can help you to achieve your goals. Gates has been proven to be the safest, most durable, and efficient industrial hoses and couplings in the hydraulic hose industry. Many different industries rely on hydraulic hose services. The automotive, construction and manufacturing industries all use hydraulic equipment and require regular inspection and replacement of hoses to ensure safer and more efficient operations. When you purchase a custom hydraulic hose assembly from LaCava Brothers Auto Supply, you ensure that you get hoses and construction methods that are designed specifically for the type of work that the hose assemblies are required to do. This is why we use top quality Gates hydraulic hoses, couplings, and fittings to ensure the proper service and fit on the job site. The fittings are crimped onto the ends of the hoses according to industry requirements to ensure that the structure of the hose is not compromised in any way to provide a maximum return on investment. If you require hydraulic hose services in the Greater Fall River area, you can count on LaCava Brothers Auto Supply to provide you with the best possible solution for your business. This is why we offer hydraulic hose services seven days a week and only use the best quality materials for our custom hydraulic hose assemblies. We can provide both small and large orders of any type of hydraulic hose assembly. We take pride in delivering services that exceed expectations, ensuring a quick turn-around to decrease downtime and ensure a safe working environment for you and your employees. 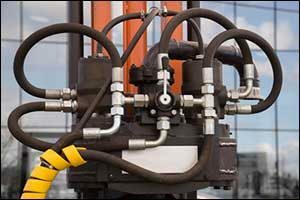 Stop guessing about the size and fit of your hydraulic hoses. Our team will create the best solution for hydraulic hoses and fittings to get the job done right. Temperature ranges, the type of fluid or gas being used, the environment where the equipment is being used, pressure variances and other requirements must all be met to ensure proper results. 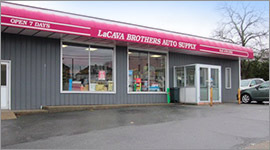 For over seven decades, LaCava Brothers Auto Supply has provided top quality services to our customers. Whether you require hydraulic hose services or rotor turning services in Fall River, you can trust our team to provide you with reliable services. We also offer free battery testing in Fall River and free installation of newly purchased windshield wiper sets at our Bedford Street location. We go the extra mile to make sure that our customers have all of the top quality parts, services, and support they need. Make sure to come by our location to see our wide selection of parts, accessories, and tools or give us a call at 508-676-1951 to learn more about our hydraulic hose services and other offerings at LaCava Brothers Auto Supply in Fall River, Massachusetts.